There was an influx of cheap(ish) handheld electronic games at the tail end of the Seventies and beginning of the Eighties (think Grandstand’s ‘Invaders From Space’ game, a clone of Space Invaders). This was beginning of the home gaming revolution, which would quickly overtake Arcades as the preferred environment for gamers worldwide. 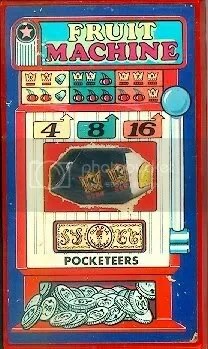 Before the electronic handheld game, and during its early years, there was a competitor, made by Palitoy, called Pocketeers, a range of distinctly non electronic handheld offerings. 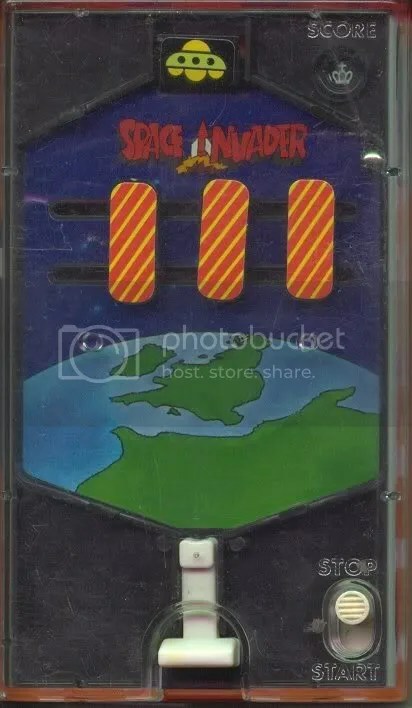 Basically, you wound up the barriers, they moved from side to side and you had to fire a tiny ball and try and hit the U.F.O at the top of the screen. That was it. No waves of attacking aliens, no damage to shelters that protected you from the invaders missiles. Bit boring, with limited appeal. I remember being excited at the prospect of playing, but feeling VERY let down by the reality. Ho hum. What it did do well, and one I particularly enjoyed, was the Fruit Machine, providing you didnt mind not getting any cash if you got 3 bells etc….